Pullups are the squats of the upper body and not much else can match making you stronger in that body region. Pullups are said to be one of the absolute best exercises you can do- if you can do them. You cannot substitute other exercises for pullups such as rows and lat pulldowns because they just won't do the job; however there are some progressions you can work on until you can perform a few more than 1 or 2 true pullups. Even if you cannot budge yourself from the grips of gravity don't fret. These progressions are made for everyone to perform. 1. 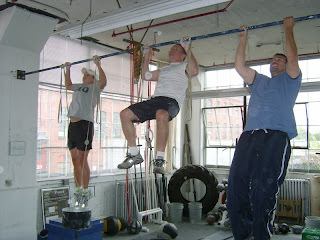 The first progression and one of my personal favs is the Jumping Pullups. Jumping Pullups imitate the actual form of a true pullup as long as you use your arms as much as you can rather than rely on the leg momentum. This is also a good heart rate increaser as well because you are using full body movements. Then use your legs to aid in your ascent. Jump only enough to aid your upper body in pulling you up so that your chin gets above the bar. It's ideal to get the collar bone to the bar if you can. Perform 10-20 or even more reps depending on your training program. Use your upper body as much as you can so that it continues to get stronger and pretty soon you can remove the jump element out of the equation. 2. Another progression is using a Smith Machine, Squat Rack, or even a Universal Pullup Station machine. Setup and Technique: Position the bar so that it's at chest or ribcage level. Then lean back and perform what's called "Supine(or laying face up) Rows". It will look like you are doing a reverse pushup with your body facing upward toward the ceiling. Your legs will be together and you will be on your heels with the soles of your feet off the floor completely. Your legs will be extended and your arms will begin perfectly straight. Then simply pull your body up to the bar so that your chest touches it. The more horizontal you are the more difficult it will be. The more vertical you are the more easier it is. So that being said if you can only do 10 in a certain position don't stop there, but simply get more vertical and keep going and going until you've reached your desired rep.
3. A third progression is using a stretch band. Jump Stretch makes a great "Assisted Pullup Package" which consists of 3 bands (1 Strong, 1 Average, and 1 Light) that are perfect for all pullup fitness levels especially if you are just starting out. Setup and Technique: The setup is very quick and simple. All you do is attach the band to the chin-up bar by slip-knotting it around and then insert one of your feet through the loop in the band. The band will assist you as you pull yourself up by taking some of your weight off your arms and placing it on the bar. I really like this method and it really works well even with kipping*. *Kipping is a progression beyond these which involves a slight hip swing. Kipping is very useful for high rep pullups after your body has been fatigued with strict pullups. My recommendation is to first start with the Jumping Pullups and just know this is a systematic progression protocol to building overall great physical strength. Regular practice of these progressions will soon have you performing full, unaided pullups, but the key is practice. No matter if you can do zero right now just using these progressions alongside a smart and stable strength or fitness protocol you will succeed at achieving the body you desire.